Countless dental surveys have found that Americans place a very high value on the appearance of their teeth. A nice smile tops the list of the most important features to have along with clear skin, bright eyes and beautiful hair. Thanks to innovations in cosmetic dentistry, you can get a perfect smile in just a few appointments at the Matthews, NC dental office of Dr. David Feeney, DDS. Therapy for a “gummy smile,” which is a disproportionate amount of gum tissue and too-small teeth. In some cases, your Matthews cosmetic dentist will recommend a combination of cosmetic treatments to help you get your perfect smile. For example, your treatment plan may include Invisalign clear aligners to reposition your teeth and professional whitening to make them look brighter. 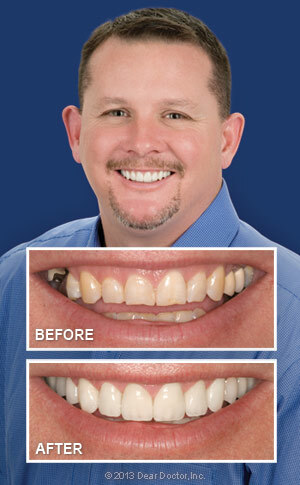 In some cases your dentist might need to use both veneers and crowns to recreate your smile. Your perfect smile is just a phone call away. Contact the cosmetic dentist in Matthews, NC to explore the cosmetic solutions available. The team is committed to “harmony in dentistry” using state-of-the-art tools, restorations, and treatments. Dr. David Feeney, DDS in Matthews, NC offers cosmetic dentistry. Call us at (704) 847-1000 to schedule an appointment!